This sticker features Nestdafoe’s signature smiling character along with the artist’s tag. When asked about the images he uses in his work, he said, “In general I have my own character, "The FOE", to reclaim the streets. But for some works or places I choose images I think they are suitable, pretty or just funny. It depends on my mood or location”. 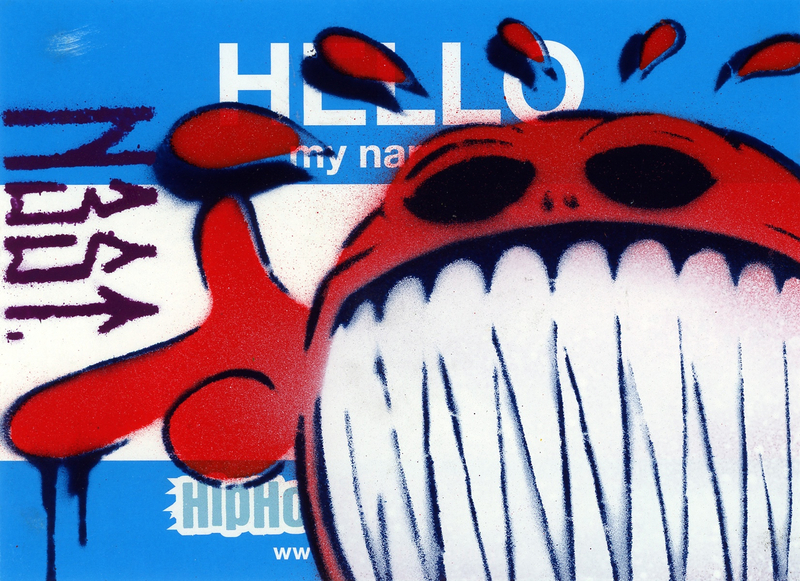 Stenciled over a ‘Hello My Name Is’ sticker, this is an example of sticker artists using widely distributed and available stickers to ‘tag’ and place in public areas to gain recognition. Describing why stickers appealed to him, Nestdafoe said, “That’s the fact of being flexible and quick with adding images to the public area. Also to get wider attention in an easy way of acting."